This multifunctional detector, developed with support from the Gas Research Institute (GRI), combines previously separate instruments into one small, lightweight package at a fraction of the total cost. Two types of combustible gas sensors, an electrochemical combined carbon monoxide (CO) and hydrogen sulfide (H2S) sensor, an electrochemical oxygen (O2) sensor, a built-in pump and microprocessor control provides fast and accurate gas readings. 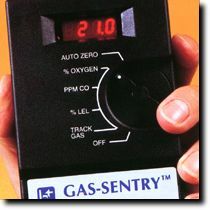 The Gas-Sentry is used for verifying the safety of breathing air prior to entry and while working in confined spaces and during post fire overhaul, locating combustible gas leaks and outdoor / indoor differential CO readings. Now you can carry one detector and do the whole job both indoors and outdoors. The detector comes with a standard 12 inch two piece probe, a metal telescoping flue probe with refillable interference filter, a gooseneck probe, a manual, a laminated short guide to operation, a set of batteries, a carryall with pouch for standard probe and flue probe, and a shoulder strap. Also included is automatic calibration which is a standard feature built into all Gas-Sentry detectors. Using Bascom-Turner's calibration gas, delivered either manually or by an automatic gas dispenser, detectors are automatically calibrated in about 30 seconds. UL listed for hazardous locations, Class 1, Div. 1, Groups A, B, C, and D.
� Copyright 2008-2012 Bascom-Turner Instruments, Inc. - All Rights Reserved.